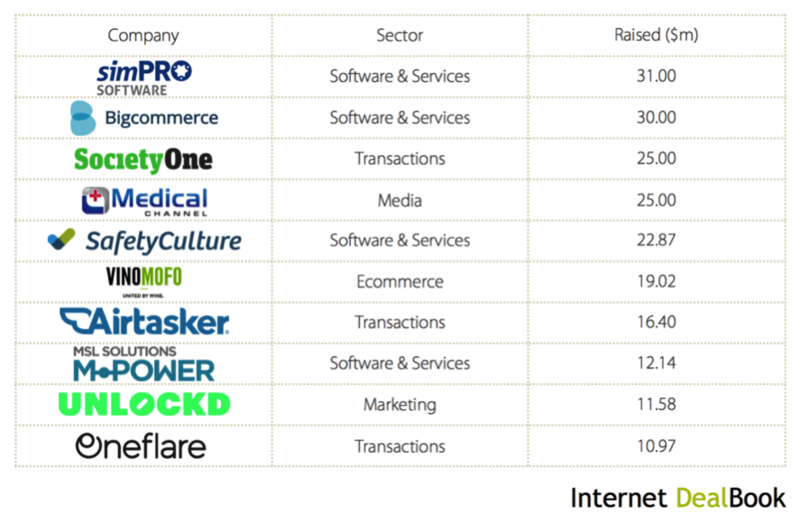 In our ‘Internet Dealbook’ we track Angel, VC, PE and M+A activity across Internet and technology-related companies. Last year Australia saw $2.9b in investment and acquisition activity across the 120 deals tracked from public sources, and the outlook for 2017 is very positive. Next year will see the first of the Federal Government initiatives being rolled out, such as the AU$1.1b National Innovation and Science Agenda. We also foresee an increase in the number of investment deals, as Australian venture capital investors were busy raising funds in FY2016. We also predict larger cheques to be written for later-stage technology companies, as well as exponential growth to occur in investment and acquisition activity within the Software and Services sector. 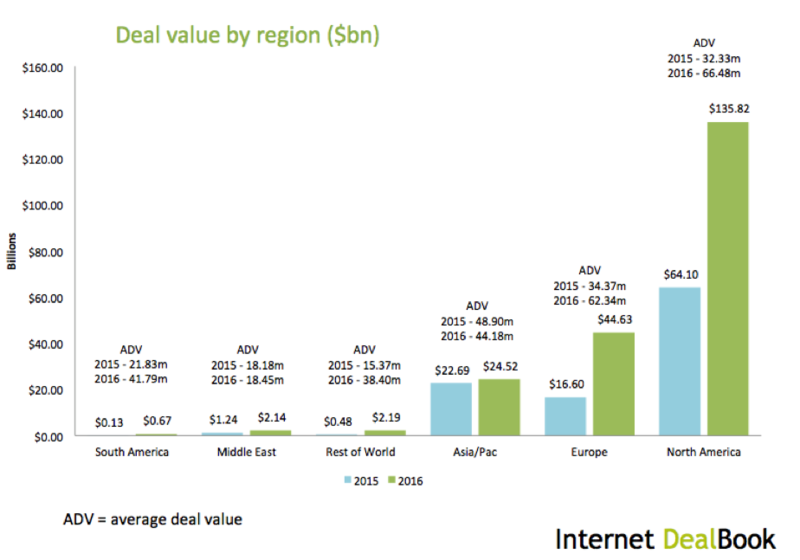 Right Click Capital’s 2016 Internet DealBook Report has revealed that over $406.0m of investments and $2.5b of acquisitions were made globally, at average deal values of $5.7m and $112.2m respectively. For the purpose of this report, it should be noted that number of deals refers to those with both disclosed and undisclosed figures. All amounts are in USD. 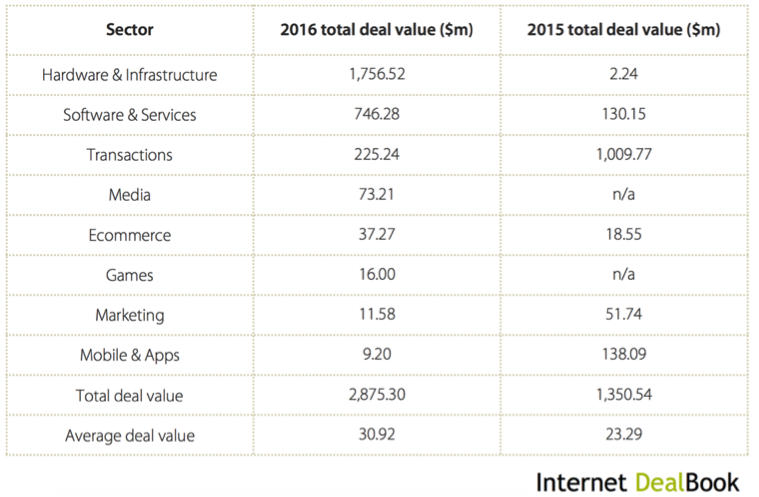 Both the Hardware and Infrastructure sector and the Software and Services sector led the way in regards to the number of deals recorded in 2016. Total deal value for the Software and Services sector increased to $746.3m (almost six times that of 2015), while total deal value for the Transactions sector decreased to $225.2m from $1b. Overall, average deal value in 2016 increased by 24.7% to $30.9m. The Hardware and Infrastructure sector accounted for just eight of the 120 deals completed in 2016, yet the total value of these eight deals far succeeded those of other sectors, reaching $1.6b (compared to just $2.2m in 2015). 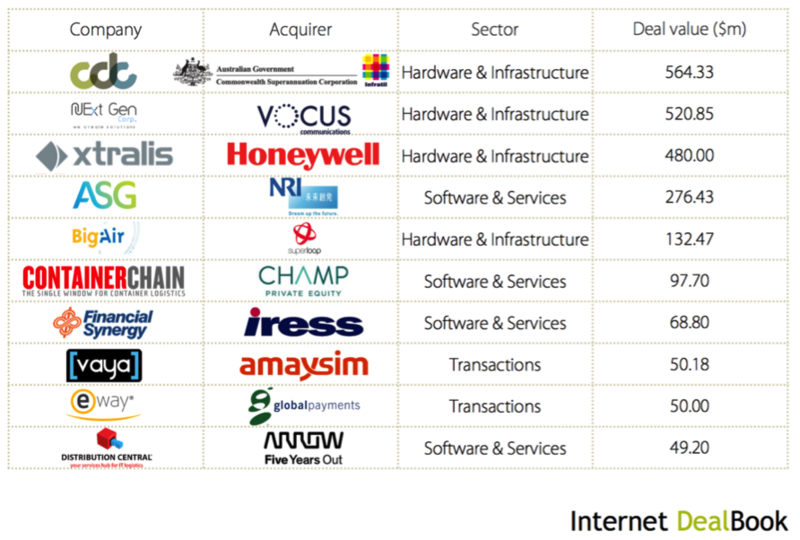 This was largely due to the top three deals (in order of deal value) that fall within this substantial category; namely, Infratil and Commonwealth Superannuation Corporation acquiring Canberra Data Centres for $564.3m, Vocus communications acquiring Next Gen – a leading supplier of network connectivity and data centre facilities – for $520.9m, and finally the acquisition of Xtralis – a safety and security solutions provider – by Honeywell for $480m. In the Software and Services sector, the average deal value for investments increased to $4.2m in 2016 from $2.7m in 2015. Growth was driven by a larger average seed round, with the average seed funding per round increasing in 2016 to $800,000 from $500,000 in previous years. 2016 also recorded larger rounds of funding for later-stage technology companies in Australia, with MSL Solutions raising $12.3m, Whisper raising $9.1m and Culture Amp raising $7.7m in its series B round. Top acquisitions included the sale of Hewlett Packard Enterprise-certified Kapish to Citadel Group for $12.6m, and Melbourne IT’s acquisition of InfoReady – data and analytics company - for $11.5m. Companies operating in the Transactions sector can be defined as businesses facilitating interactions between two or more parties, including crowd sourcing platforms, directories, group buying, marketplaces and payment systems. The apparent sharp decline in total deal value between 2015 and 2016 can be attributed to Just Eat's hefty acquisition of Menulog for a substantial $687m in 2015, which influenced total deal value in the sector. Omitting this deal, we can see that the average deal value between 2015 and 2016 only declined slightly. A total of 56 deals occurred in the Transactions sector in 2016. The top deals included Airtasker raising $16.6m in August 2016 and Oneflare raising $11m in June 2016, from a consortium of local and global investors. 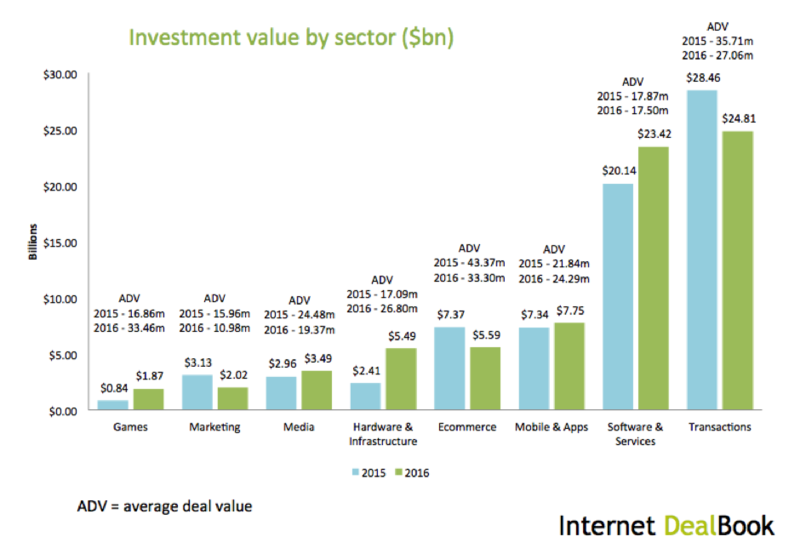 It’s safe to say that 2016 saw a record increase in the total value of investments tracked by Internet DealBook, along with the birth of a number of new funds. 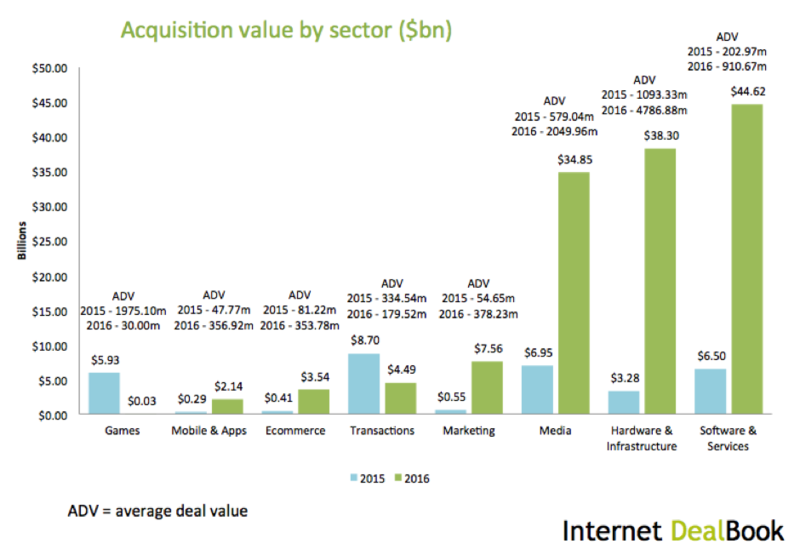 Over $209b worth of investments and acquisitions took place, with 5,350 deals tracked from public sources. Compared to 2015, deal activity was much stronger, with $106b in deals tracked from 3,943 deals in 2015. Breaking deal numbers and values down across regions, proportions were similar to previous years. Following historical trends, North America took first place with a total deal value with $135.8b (a figure more than double that of the previous year’s $64.1b). This equates to 3,036 deals taking place in the region, making up more than half the number of total global investments. Europe saw a considerable increase in deal activity with an aggregate $44.6b across all sectors; a figure almost tripling that of 2015. Average deal value across both investments and acquisitions ended the year at $62.3m, almost twice that of 2015 ($34.4m). With regards to venture funding, Europe also presented a seven-year high in the amount of venture capital raised, levelling at $10.5b across 62 funds. In total, 281 acquisitions and 872 investments were recorded in the region last year, with an average acquisition value of $1.4b (almost three times that of the 2015 figure of $502.6m). Looking at Asia Pacific, deal value increased to $24.5b from $22.7b in 2015, while average deal value fell by 10% to $44.2m. China, Singapore and India finished 2016 in the top ten countries globally by total deal value, at $15.9B, $3.1B and $3.0B respectively. Interestingly to note, these countries ranked differently when ordered by number of deals – with 320 in India, 146 in China and only 81 in Singapore, suggesting that larger investment and acquisition rounds occurred in Singapore compared to China and India. 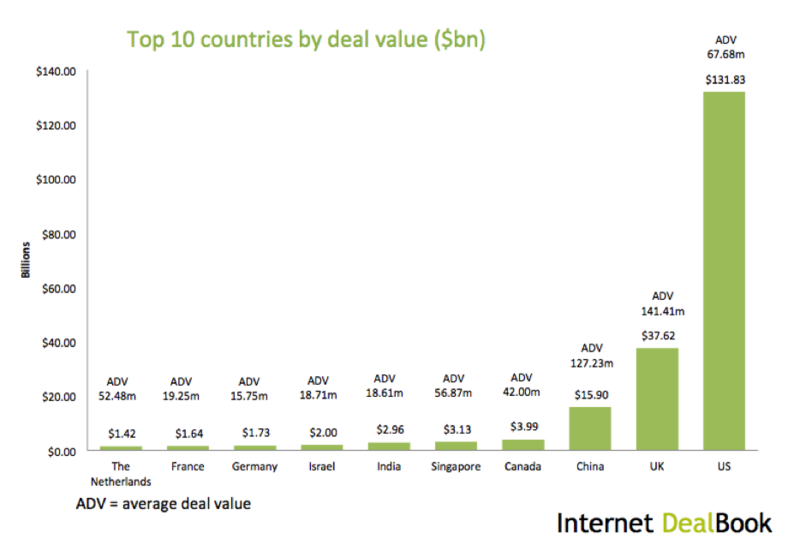 Comparing the top ten countries by deal number and value, the order was similar to that of 2015, with an evident distance between the top three countries (US, UK and China) and the rest of the cohort. While the US saw the highest number of deals, China and the UK led the pack in terms of average deal value. For the US, total deal value finished at $131.8b, with average deal value increasing considerably from $32.3m in 2015 to $67.7m in 2016 across 2,889 deals. In second place, the UK totalled $37.6b in deal value across 409 investments and acquisitions, with an average deal value of $141.1 million. China ended 2016 with a total deal value of $15.9b and average deal value of $127.2m across 146 deals. The difference in investment value in the top three regions was minimal between years, with total investment value for North America falling by 7% to $41.5b, increasing in the Asia Pacific by 10% to $22.9b, and decreasing in Europe by 3% to $7.3b. Again, North America accounted for over half of all total global investments with 2,272 investments taking place during 2016, followed by 872 in Europe and 729 in Asia Pacific. When breaking down investments in terms of average deal value, the Transactions and Ecommerce sectors saw a decrease, while both Software and Services and Mobile and Applications sector remained static. The sectors that saw an increase in average deal value were Hardware and Infrastructure ($26.8m from $17.1m) and Games ($33.5m from $16.9m). Globally, top investments were dominated by US-based companies, including $3.5b into Uber by Public Investment Fund, $1.8b into Snapchat’s Series F round, and $793.5m into VR company Magic Leap by a consortium of investors, including Chinese e-commerce company Alibaba. 2016 proved to be an interesting year for acquisitions, with the top three sectors (Software and Services, Hardware and Infrastructure, and Media) experiencing a more than threefold increase in total acquisition value, at $44.6b, $38.3b and $34.9b respectively. In contrast to investments, acquisition activity was much stronger in 2016, with a significant jump in total acquisition value for North America (381% growth to $94.3b) and Europe (312.3% growth to $37.3b). Average deal value almost quadrupled in North America (from $392.3m in 2015 to $1.2b in 2016) and tripled in Europe ($502.6m to $1.4b in 2016). Top deals included the acquisition of social network LinkedIn by Microsoft for $26.2b and Oracle’s acquisition of NetSuite for $9.5b, in a bid to expand its enterprise cloud offerings. While the majority of sectors saw increases in both investment and acquisition activity, 2016 proved to be a big year for acquisitions in particular. Overall, the most active sectors in order of deal activity included Software and Services ($68b), Hardware and Infrastructure ($43.8B), Media ($38.3B) and Transactions ($29.3B), with the top three sectors more than tripling their aggregate deal values. Looking at the top two sectors by number of deals, Software and Services accounted for over a third of total deals, at 2,174, followed by 1,350 deals in the Transactions sector. Australia’s deal landscape has certainly had a busy year and the outlook for 2017 is very positive. 2017 will see the first of the Federal Government initiatives being rolled out (such as the AU$1.1b National Innovation and Science Agenda), coupled by a foreseeable increase in the number of investment deals (as Australian venture capital investors were busy raising funds in FY2016). We also predict larger cheques to be written for later-stage technology companies, as well as exponential growth to occur in investment and acquisition activity within the Software and Services sector. Globally, there is a rising trend of global non-tech incumbents making themselves known in private markets, such as Walmart's $3 billion acquisition of Jet.com. It should also be noted that between 2015 and 2016 total value of investments decreased in North America, while acquisition values increased significantly. This suggests that the technology market in the region is maturing, with this trend expected to continue into 2017 as companies in the ‘unicorn club’ face pressure from investors to seek liquidity. Contrastingly, the Asia Pacific region saw a close to 10% increase in investment value between 2015 and 2016. The growth in deal activity in the region will likely to continue in 2017, led by small- to medium-sized technology companies seeking growth capital. 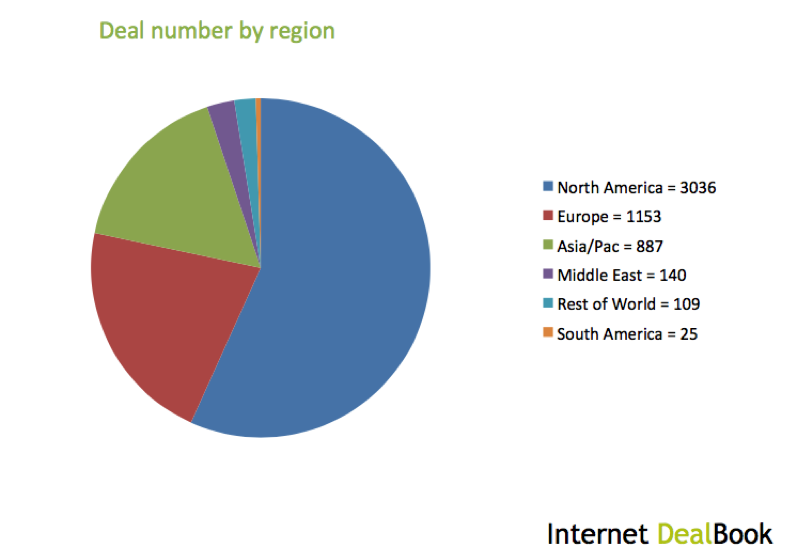 Right Click Capital’s Internet DealBook is a unique global database that tracks angel, VC and private-equity investment and M&A activity across Internet and technology-related companies.